This fellowship is a collaboration between the Ancora Foundation and Cambridge Overseas Trust to provide two fellowships annually for Indonesians to study for a one-year master’s program in any field at the University of Cambridge. Cambridge, one of the world’s oldest universities, has attracted many of the very best minds since 1209. Today the university has grown to around 17,500 students (7,000 of whom are graduate students), and 3,000 teaching and administrative staff. Of the graduate students, 50 per cent come from overseas, and well over a third are women. Historically, the university has had a very good reputation for both mathematics and the sciences. But it also has strong humanities and social science faculties. In the last two British Government research assessment exercise in 2001 and 2008 respectively, Cambridge was ranked first in the country. In 2006, a Thomson Scientific study showed that Cambridge has the highest research paper output of any British university, and is also the top research producer in 10 out of 21 major British research fields analysed. Cambridge has over the course of its history built up a sizable number of alumni who are notable in their fields, both academic, and in the wider world. Officially, affiliates of the university have won a total of 83 Nobel Prizes. It has educated 15 British prime ministers, including the first Robert Walpole. At least twenty-three Heads of State or Heads of Government have attended Cambridge. Applicants should have (a) a confirmed acceptance at any faculty at the University of Cambridge; (b) an excellent academic record with a first degree equivalent to a good Second Class (Upper) Honors or a GPA of at least 3.5; (c) a very good command of the English language; and (d) assessed to have outstanding potential for leadership in government, business, or civil society after graduation. The application deadline for 2012 entry is December 2, 2011. Please apply directly to University of Cambridge, our fellowship program is listed under Ancora Foundation Graduate Fellowship. Further details of the application process can be found in the following official website. 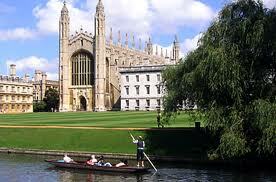 Each fellowship is tenable only for a one-year masters program in any field at Cambridge University. The successful candidate is expected to complete his/her studies within the tenable period. Demikianlah informasi Ancora Foundation Graduate Fellowship, University of Cambridge, UK kami sampaikan, semoga bermanfaat.